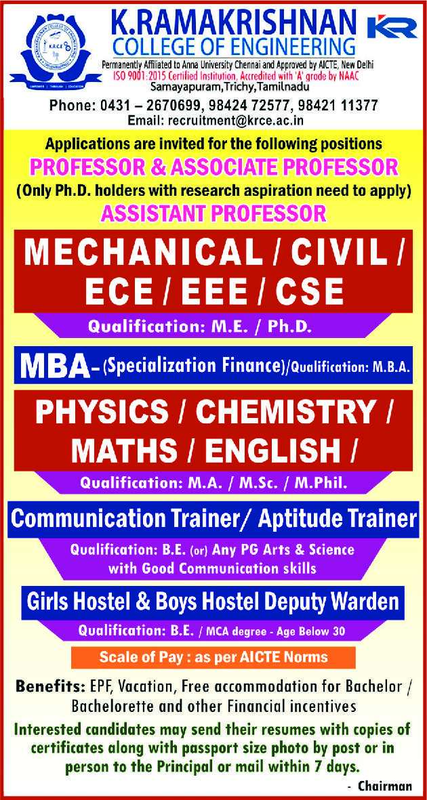 K.Ramakrishnan College of Engineering, Trichy has advertised for recruitment of Teaching Faculty- Professor / Associate Professor / Assistant Professor Plus Non-Faculty jobs vacancies. Interested and eligible job aspirants are requested to apply within 07 days from 20th March 2019. Check out further more details below. About College: K.RAMAKRISHNAN COLLEGE OF ENGINEERING, TIRUCHIRAPALLI in the famous temple town of Shri Samayapuram Mariyamman temple on the sprawling campus of 30 acres with a panoramic and pleasant view. This college stands as a testimony to the wisdom and foresight to cater to the educational needs and aspirations of the people. M.E / M.Tech / MBA / MA / M.Sc / M.Phil / Ph.D.
How to Apply: Interested and eligible candidates are requested to send their application along with CV, copies of certificates, PAN card, Aadhaar card and recent passport size photo to the email address given below or at the college address or apply in person to the Principal of the college.